The focus of the “righteousness of God” is foundational throughout the book of Romans. In fact, it is threaded through every section of the basic outline of this epistle. Paul reiterates this so that the reader may realize that salvation cannot be attained through man’s good deeds but only through faith in God’s righteousness: “I am not ashamed of the gospel, because it is the power of God for the salvation of everyone who believes… For in the gospel a righteousness from God is revealed, a righteousness that is by faith” (1:16-17). You cannot repair your relationship with God through your good deeds; this is only accomplished through faith in the perfect and finished work of Jesus Christ. 7th January 2018. The Grace of God. 21st January 2018. Romans 1:1-17. 28th January 2018. 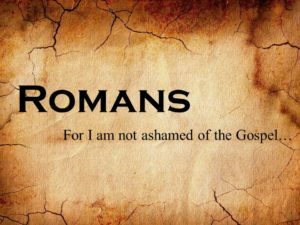 Romans 1:18 - 2:16. 11th February 2018. Romans 3:21-31. 8th April 2018. Romans 6:15-23.